Oxidized LDL but not estrogen regulates lipid abundance in macrophages. 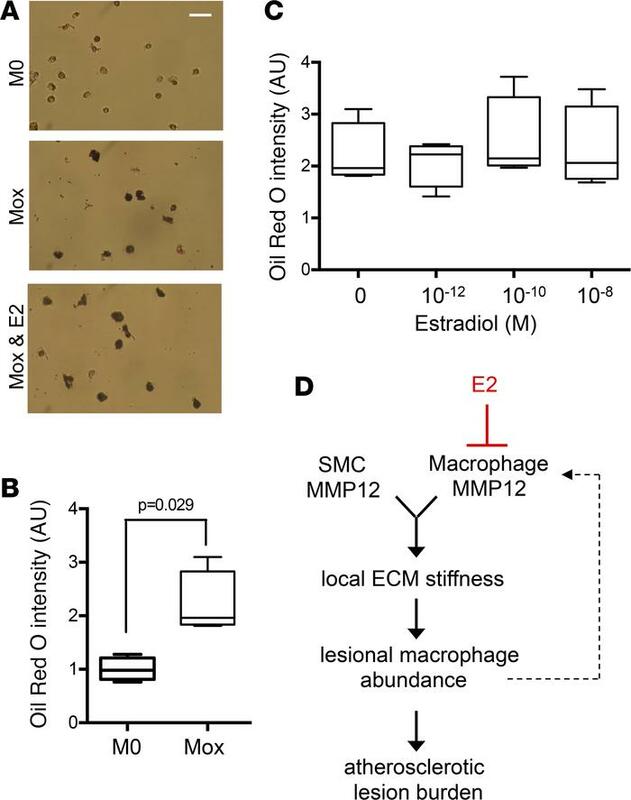 (A) Female human PBDMs were differentiated into M0 macrophages, treated with oxLDL, and exposed to selected concentrations of estradiol (E2) as in Figure 4. (A) Representative images of Oil Red O staining obtained at the end of the incubation with E2. Scale bar: 100 μm. (B and C) Quantification of Oil Red O staining from all samples; n = 4 per condition. Statistical significance for B was determined using a Mann-Whitney test and for C was determined using ANOVA. The graphs show box and whisker plots with Tukey’s whiskers; the horizontal lines of boxes represent the 25th percentile, the median, and the 75% percentile. (D) Summary model of estrogen-mediated protection from arterial stiffening and atherosclerosis.